website prior to the meeting. "Ignorance is no excuse for the law." The Lindbergh Schools Board of Education holds general meetings on the second Tuesday of each month, in addition to special meetings and workshops as necessary. Meetings are held in the Board of Education meeting room at Lindbergh Early Childhood Education, 4814 S. Lindbergh Blvd., at 7:30 p.m. unless otherwise noted. Board meetings are open to the public and district residents are encouraged to attend. Executive session meetings, which are closed to the public in accordance with Missouri Sunshine Law, are scheduled as required and held only for certain student, personnel, property and legal matters. Highway Safety Director Bill Whitfield. JEFFERSON CITY - During the winter holidays the Missouri State Highway Patrol knows that many Missouri drivers will make the conscious mistake of driving impaired so, law enforcement will make a strong effort to reduce the damage from their actions. A person be arrested for driving under the influence of alocohol, illegal drugs, marijuana, other controlled substances, or even prescription medication. A substance- impaired driving arrest could cost thousands of dollars in fines, court costs and lawyer fees, or worse yet - could cost someone's life! This year's Drive Sober or Get Pulled Over high-visibility crackdown will run through Sept. 7. 27 DUI drug arrests, 11 drug influence arrests and 127 MIP's during just the Labor Day campaign in 2014. Nationally, on average, one person will die every 34 minutes in an impaired driving crash over the Labor Day period, that's a lot of lives that could be saved. Said Bill Whitfield, executive chair to the MO Coalition for Roadway Safety. "In 2014, 197 people were killed, 703 seriously injured in Missouri crashes that involved at least one substance-impaired driver"
occur any time of the year. safe and informative web experience for our readers. Please report any problems to us immediately. Visit the vet for a spring or early-summer checkup. Make sure your pets get tested for heartworm if they aren’t on year-round preventative medication. Pets can get dehydrated quickly, so give them plenty of fresh, clean water when it’s hot or humid outdoors. Make sure your pets have a shady place to get out of the sun, be careful not to over-exercise them, and keep them indoors when it’s extremely hot. Know the symptoms of overheating in pets, which include excessive panting or difficulty breathing, increased heart and respiratory rate, drooling, mild weakness, stupor or even collapse. Symptoms can also include seizures, bloody diarrhea and vomit along with an elevated body temperature of over 104 degrees. Animals with flat faces, like Pugs and Persian cats, are more susceptible to heat stroke since they cannot pant as effectively. These pets, along with the elderly, the overweight, and those with heart or lung diseases, should be kept cool in air-conditioned rooms as much as possible. Never leave your animals alone in a parked vehicle. Not only can it lead to fatal heat stroke, it is illegal in several states! Do not leave pets unsupervised around a pool—not all dogs are good swimmers. Introduce your pets to water gradually and make sure they wear flotation devices when on boats. Rinse your dog off after swimming to remove chlorine or salt from his fur, and try to keep your dog from drinking pool water, which contains chlorine and other chemicals. Open unscreened windows pose a real danger to pets, who often fall out of them. Keep all unscreened windows or doors in your home closed, and make sure adjustable screens are tightly secured. 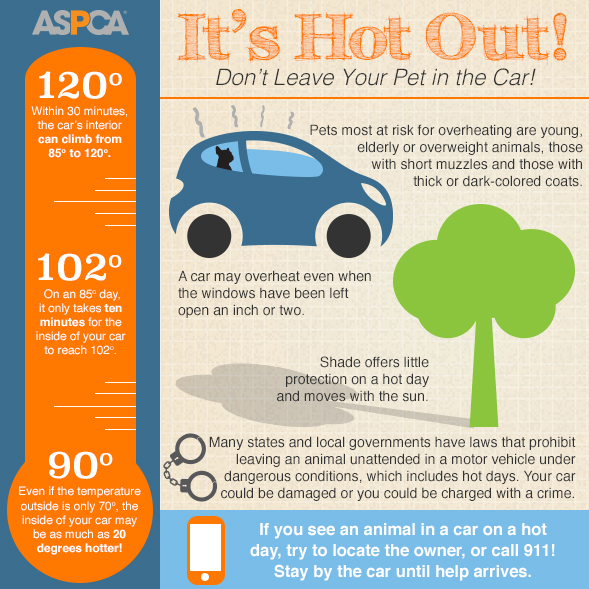 When the temperature is very high, don’t let your dog linger on hot asphalt. Being so close to the ground, your pooch’s body can heat up quickly, and sensitive paw pads can burn. Keep walks during these times to a minimum. Commonly used rodenticides and lawn and garden insecticides can be harmful to cats and dogs if ingested, so keep them out of reach. Keep citronella candles, tiki torch products and insect coils of out of our pets’ reach as well. Call your veterinarian or the ASPCA Animal Poison Control Center at (888) 426-4435 if you suspect your animal has ingested a poisonous substance. Remember that food and drink commonly found at barbeques can be poisonous to pets. Keep alcoholic beverages away from pets, as they can cause intoxication, depression and comas. Similarly, remember that the snacks enjoyed by your human friends should not be a treat for your pet; any change of diet, even for one meal, may give your dog or cat severe digestive ailments. Avoid raisins, grapes, onions, chocolate and products with the sweetener xylitol. Please visit People Foods to Avoid Feeding Your Pets page for more information. Please leave pets at home when you head out to Fourth of July celebrations, and never use fireworks around pets. Exposure to lit fireworks can potentially result in severe burns or trauma, and even unused fireworks can contain hazardous materials. Many pets are also fearful of loud noises and can become lost, scared or disoriented, so it’s best to keep your little guys safe from the noise in a quiet, sheltered and escape-proof area of your home. Be prepared in the event that your pet does escape by downloading the ASPCA Mobile App. You’ll receive a personalized missing pet recovery kit, including step-by-step instructions on how to search for a lost animal in a variety of circumstances. For other ways to help, download and share our hot weather safety infographic to alert others of the dangers your pets may face during the summer.